Frontline Construction LLC is a family-owned business with over 10 years of combined experience doing home renovations all over Franklin. We can help you accomplish any home improvement project, but our specialty is remodeling bathrooms by creating breathtaking and functional designs. And while there are many things we can do to make you the bathroom of your dreams, the most important piece to tie the room together is a brand new custom tile shower. Transform your everyday bathroom into a beautiful, relaxing retreat when you call Frontline Construction LLC and schedule an appointment to find out what we can do for you. When you choose Frontline Construction LLC to remodel your bathroom and install a new custom tile shower, waterproofing the tile shower is our top priority. Creating a relaxing environment with the right combination of colors, sizes and styles to complement the bathroom’s design as well as your personal taste is not an easy task. And without proper waterproofing, all the progress we make can be undone when you realize your beautiful new bathroom is growing mold. That is why we only use Schluter Systems products when remodeling your bathroom because it is the only way guarantee your new bathroom is properly waterproofed and mold-free. 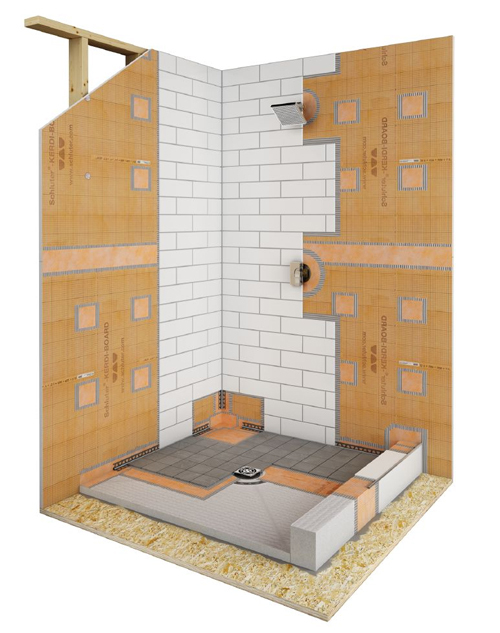 Schluter-KERDI is a malleable, sheet-applied waterproofing membrane and vapor-retarder designed to sit behind your shower walls and other tiled elements of your remodeled bathroom that are prone to accumulating moisture. The Schluter-KERDI uses a modified polyethylene core with non-woven polypropylene on both sides to anchor the membrane in the thin-set mortar. Or, in other words, Schluter Systems special design helps your bathroom resist mold and mildew longer than its competitors. Thanks to our discriminating tastes in building materials, and our exclusive use of Schluter Systems products because they are the best the industry has to offer, you can trust that your new Franklin custom tile shower is not only beautiful, but built to last l.
There are two types of shower stalls you can install to make your bathroom feel brand new: prefab showers and custom tile showers. Prefab, short for pre-fabricated, showers are built in a factory and shipped to your home in one or several pieces before it’s installed in your bathroom. On the other hand, tiled showers are built on site from scratch by Frontline Construction LLC’s expert craftsmen. Prefab showers are ideal if you want a new shower quickly. They are fast and cheap but are limited in terms of design. Meanwhile, when you choose a custom tile shower, there are infinite design possibilities, especially once you’re paired with one of the interior decorators we work closely with. Not to mention, installing a custom tile shower in your Franklin home can help increase its resale value down the line. 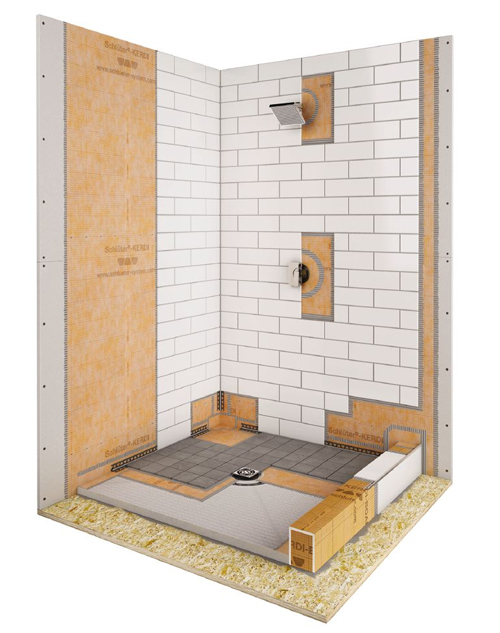 When you choose Frontline Construction LLC to build a custom tile shower for your home, not only can you rest easy knowing that you are getting quality craftmanship with only the top of line the Schluter Systems waterproofing products, you are also investing in your future. The reason a tile shower can increase the value of your home is because they can last up 60 years or more if installed correctly, which we guarantee to do when contracted to remodel your shower. Call (724) 290-7207 today to find out how we can get started on the custom tile shower you have always wanted.